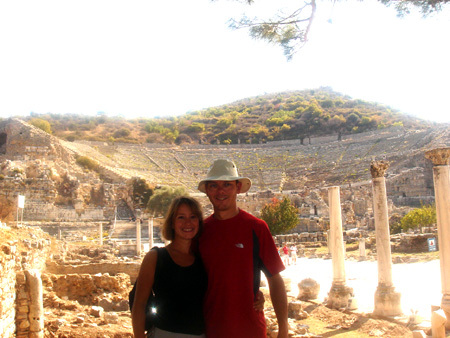 Having spent the night in the famous seaside resort of Kusadasi, we emerged early in the morning bright-eyed and bushy-tailed, to take in the sights of the famous ancient city Ephesos. 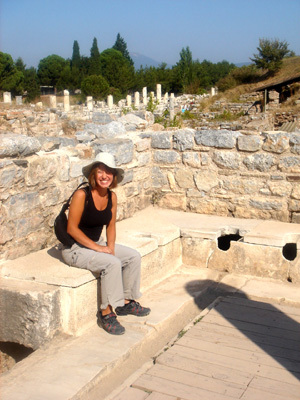 The history of the city of Ephesos, which today lies at the silted-up harbour at the mouth of the Kaystros (Küçük Menderes), stretches back to the Neolithic period, achieved its heyday in Greco-Roman antiquity, and experienced a final flowering during the Selçuk dynasty of Aydinogullari in the 15th century A.D. 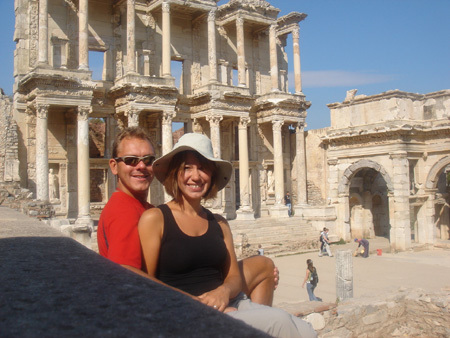 The Artemis Temple or Artemision was one of the Seven Wonders of the World and located in Ephesus. Sadly it was sacked by the Goths (no, not Sisters of Mercy despite the fact that they have a lot to answer for!). 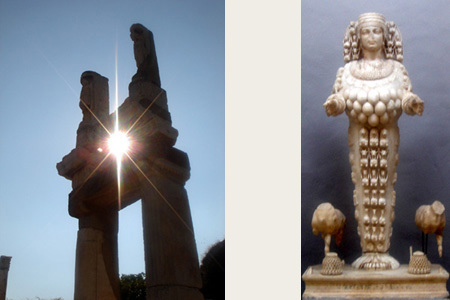 Stones from the temple were taken to build the Agia Sophia church in Istanbul, so only a single column remains from it today, however the statue of Artemis which was located at its heart was found intact and exhibited in the local museum. The site is very impressive to say the least, the main street really gives a feel of how the city felt to its inhabitants, 2000 years ago. Walking down this we took in several temples, rich citizens’ houses, the brothel (‘love house’), the amazingly intact Library, and the absolutely massive Grand Theatre, even in today’s terms. In fact the Grand Theatre could seat up to 25000 and was in use until recently for concerts! 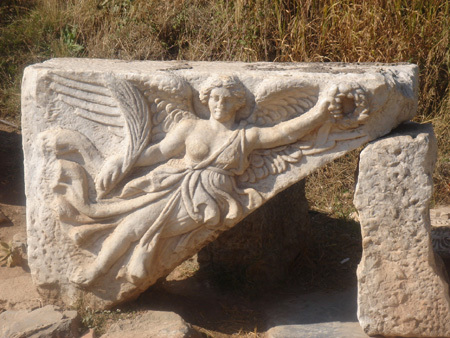 Another impressive sight was the very detailed relief of Nike – the Greek goddess of victory and sister of Adidas :p. It is said that the current Nike emblem is a copy of a fold in her dress. What also impressed us greatly was how advanced the civilisation was in the Roman era – the streets were lit (you could see the torch holes), and there was an underground sewage system and hot water piping for heating in each building. One disturbing thing however were the latrines – they were communal and unisex, for all citizens rich or poor, however there were no stalls and therefore no privacy! No toilet paper either as there was a running stream of thermal water underneath each latrine which was used to wash themselves afterwards. We concluded our tour by a trip around the local museum, exhibiting the more delicate artefacts and statues from the site (and anything else left behind by the guys from the British Museum and other European museums!!). Completely amazed and awed we caught our night bus back to Istanbul, to finish our final chores and get back on the road after spending our last night in Istanbul!